As most of you know we had strawberries earlier this week, seems they wanted to be ready before we did… therefore we will probably not have berries this Saturday. If the weather cooperates there could be a few. However we will have available this week… Swiss chard, spinach, and kale. Asparagus for the final week, green onions, rhubarb and beautiful radishes. We will also have a variety of lettuce… Italian blend, Red Sails, Simpson Elite and Grand Rapids. Kenny has been cutting mint and cilantro so I guess we will bring some of that too. We will have some fresh herbs and a few flowering plants (at sale prices) available this weekend. 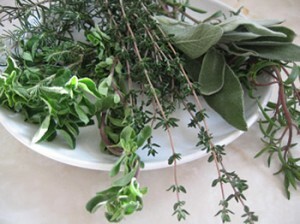 We have basil, dill, parsley, cilantro, oregano, thyme, sage, a few tarragon and rosemary. Don’t forget to pick up your farm-fresh, free-range eggs at the market. Just a reminder that we have been selling out early each week… so come early or pre-order to make sure you get the items you need.